Gotta Have It or Live Without It! Morning, Everyone! So, I wasn’t planning on doing another Gotta Have It or Live Without It makeup review today, but this one is important to me! 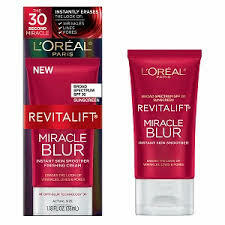 Today, I wanna review the L’Oreal Revitalift Miracle Blur, which is a primer. The claim is that it will even your skin tone, smooth your skin, and reduce pores and fine lines. You can purchase this at Walmart, Walgreens, Target, Ulta, or anywhere that sells products from different cosmetic lines. Even though I picked mine up at Walmart, it was a bit pricey for a drugstore product. I bought this for around $20. The reason I purchased this was because I heard really amazing things about it. I swear by Benefit’s Porefessional Primer and someone told me this was dupe for that… so, naturally, I went out later that day and bought it! haha I couldn’t wait to use it the next morning and I was excited that I might have found a new primer to recommend to my clients (I’m always on the look-out for new products for them to try). Well, the days came and went and I used this product on the daily. I felt that it really did help reduce the size of my pores and, since I’m 20 I don’t yet have any fine lines to worry about, but I would have felt comfortable using this on my more mature clients to help with their lines. Everything was going amazing until I woke up one morning to an entire face filled with breakouts. You can bet that freakout mode was initiated. I’m not new to breakouts, in fact, I’m very used to them. But I had at least 10 spots of all different sizes and that’s something that I have NEVER dealt with on my face before. I stopped using this product immediately. Since I wasn’t 100% sure that it was this primer that caused this horrible problem for me, I’ve tried it a few times since then. Each time I end up with a zit in the spots I applied it. In fact, I used this primer again just yesterday and this morning I woke up with a zit exactly where I had used it. Now, I’m absolutely, 100%, without a doubt in my mind, positive that this is the culprit. The final verdict? LIVE WITHOUT IT! Keep in mind, this is just my personal story of what happened to me. Feel free to try this out, but use at your own risk. And, keep in mind as well, that as a makeup artist, I would never feel comfortable applying this to anyone’s face or recommending it to them. Steer clear, ladies! There are a million other primers out there to try and I would hate for anyone to mess up their beautiful face because of one product!